According to the most recent Census data, there are close to 300,000 housing units in the Denver county area of which 22,690 are vacant. Of this vacant number, there are 10,292 rentals that are for rent. Of the total available rentals, there are approximately 5,000 houses for rent in Denver at any given time. There are a few reasons why there are so many houses for rent in the Denver area. The first is the amount of demand for rental housing has increased dramatically since the cost to purchase a home has increased so much. With the recent rise in interest rates and appreciation of homes, this has made it difficult for most renters to purchase a home. The cost of living has also risen and income has not risen nearly as quickly as the housing market. This has given homeowners the option to either sell or rent out their property for a hefty profit. Some homeowners are opting to rent out their homes for longer periods of time so they can continue to increase their original housing investment. Denver was also recently ranked the third best place to live behind Austin and Colorado Springs. With beautiful weather, a strong and educated job market, low unemployment rate of 2.6%, a relatively young population with a median age of 36.2 years and relatively low average commute times of 27.3 minutes, this has made it an ideal place to live. 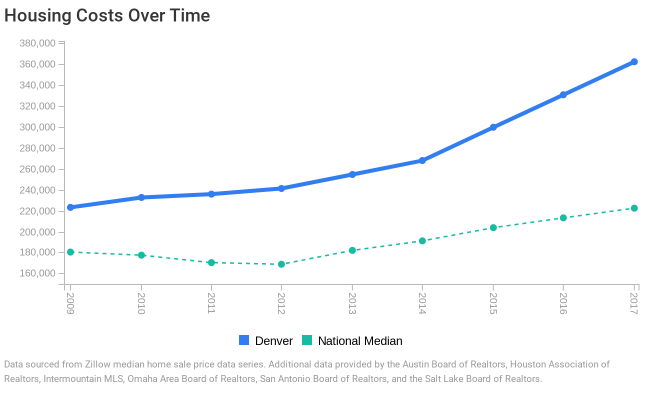 With all that said, the Denver housing costs have also significantly outpaced the national average over the last 9 years. We may begin to see a slow down in the Denver homes for sale market which may bode well for renters looking to get into the Denver single family home rental space. This increase in supply for rental properties due to an increase in new rental construction and future for sale homes turning into rentals may mean more rental competition, more concessions and hopefully lower rental rates in the relatively near future for those looking for a Denver rental property.